Some 200 wine-growers throughout German wine country share something in common: the “VDP eagle” – a stylized eagle bearing a cluster of grapes. It appears on the capsules of their wines as a guarantee of pure wine pleasure. It guarantees wines of the highest quality from some of the finest wine estates in Germany, and provides both wine novices and connoisseurs an incentive to discover the world of fine wine. Subject to high standards, the VDP and its members are a bastion of quality in today’s globalized world. They oppose anything that makes wine nondescript and artificial. They are an alliance of wine fanatics who work hard in stony soils and on steep slopes to bring forth the best from their outstanding vineyard sites. They believe that wine is an expression of joie de vivre, be it a 100-point cult wine or a dependable, more affordable regional wine in the Gutswein category. The “VDP eagle” stands for both. There’s no better sign of quality. 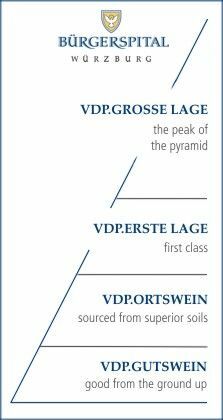 The VDP.CLASSIFICATION is based on an in-house statute of Germany’s Prädikat wine estates, in which the quality of a wine is defined according to “terroir,” i.e., origin and quality are inherently linked. For the Prädikat wine-growers, the vineyard site is the decisive mark of quality. The goal of the Classification is to assess the quality potential of Germany’s very best vineyard sites; secure the future of Germany’s unique viticultural landscape; restore esteem for Germany’s outstanding dry wines; and underscore the traditional connotation of the Prädikats as attributes reserved for wines with natural, ripe sweetness. They represent our finest segment and are a guarantee for the finest selections, implicating special care and attention producing legendary wines. "Große Gewächse" are dry wines from VDP.GROSSE LAGE and labeled "Qualitätswein trocken". "Große Lagen" designates the very best vineyards of Germany, within which the finest parcels have been narrowly demarcated. With their site-specific characteristics, these wines are particularly expressive and have exceptional aging potential. They are planted with traditional varieties best suited to a particular site, as determined by each region. Red Premium Wines are vinificated from individually selected grapes of highest quality and matured in small oak barrels. The designation "R" is an international orientation representing the finest dry red wines. Sweet Premium Wines are highly concentrated, with very distinctive aromas, complex structures and with long-lasting aftertaste. They are labeled with one of the traditional Prädikats: "Spätlese, Auslese, Beerenauslese, Trockenbeerenauslese" or "Eiswein". "Erste Lagen" designates first-class vineyards with distinctive characteristics. They provide optimal growing conditions, as evidenced over a long period of time. They are planted with traditional varieties, as determined by each region. A dry wine from VDP.ERSTE LAGE is labeled "Qualitätswein trocken." "Ortsweine" originate from a village’s best vineyards that are planted with grape varieties typical of their region. A dry VDP.ORTSWEIN is labeled "Qualitätswein trocken", wines with natural, ripe sweetness are labeled with the traditional Prädikat "Kabinett". "Gutsweine" are good, entry-level wines in the VDP’s hierarchy that inherently links wine quality with origin. The wines originate from an estate’s holdings within a region, and they meet the stringent standards prescribed by the VDP.